This pair of comfortable leather Alegria clogs comes with a rubber sole and low-top from the arch. The 1.5 inch heal is enough to provide added height, without causing pain in the foot. The platform itself is an inch, so the heel only extends up an additional half inch. The cloth covered buckle brings beautiful detail to the clog. These discount Alegria clogs are anatomically designed for optimal comfort. Reminiscent of your grandmother’s classic china, these Alegria nursing clogs offer the necessary support and comfort you’re in search of. The beautifully crafted leather shoes feature a non-slip rubber sole for the best possible traction. The cushioned, flatform sole envelopes your feet to prevent any kind of uncomfortable rubbing. This way, your feet are as comfortable and refreshed as when you slipped your feet into the Alegria clogs. With a 1-inch platform and a heel measuring up to 1.5 inches, the Alegria Women’s Paloma Flat gives you just enough added arch height to support excellent posture throughout the day. This way, you’ll begin feeling less back pain as you go about your day, which is perfect for when you know you’ll be up and moving about for long periods of time. It’s time to add a little bling to your workday with the Alegria Women’s Dayna Flat. This pair of Alegria nursing shoes brings with it a little extra color and sparkle. It also features a comfortable design made specifically for people like you who spend long hours on their feet. With a leather construction and rubber sole, the Alegria clogs are both comfortable and secure, so you don’t need to worry about what kinds of liquids might have spilled on the floor. Plus, the elevated lip on the back of the shoe keeps your feet snug, in order to prevent your skin from rubbing up against the leather. The rubber sole measures up to one inch, with the heel measuring up an additional half inch. You’ll never again have to sacrifice comfort for function with these Alegria shoes clogs secured around your feet. 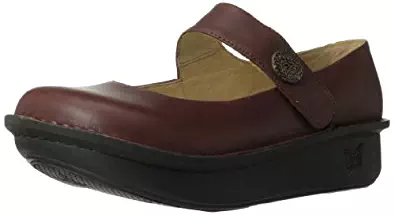 When you want a shoe that’s comfortable, non-slip and yet easy to take on and off, check out the Alegria Women’s Seville Clog. 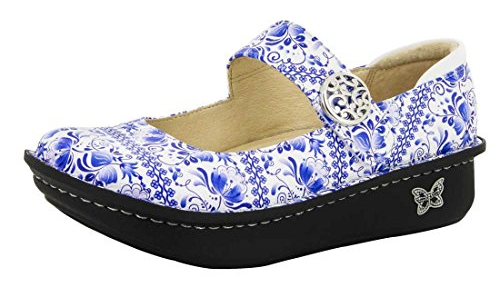 All of the Alegria nursing shoe reviews about this pair of clogs are through the roof, with it averaging above a 4.5 star (out of 5) rating. Made from leather and featuring a synthetic sole, the shoe helps keep your feet feeling comfortable and the rest of your body pain free. With a removable memory foam interior, your feet will feel right at home. Add in the latex and cork footbed with suede top, you’ll quickly wonder why you didn’t invest in this comfortable pair of Alegria shoes earlier. Plus, the two inch heel is just half an inch higher than the toe, which ensures a subtle elevation in your arch, which helps you avoid not only foot pain, but discomfort in your legs and lower back as well. If you’re looking for the combination of traditional and comfort, the Alegria Women’s Paloma Professional Mary Jane Flat is the way to go. 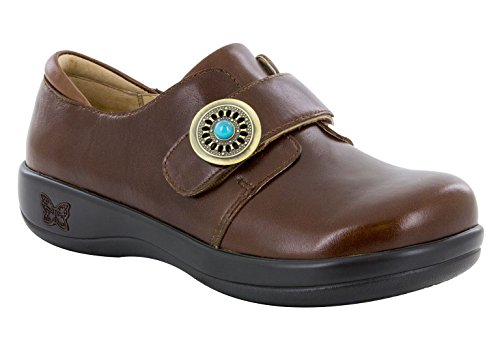 This pair of Alegria nursing shoes features a leather top with simple strap that keeps your foot snugly in place, and a rubber sole, to keep your traction and prevent slipping. If you’re looking for even more comfort, this pair of Alegria Women’s Paloma Professional Mary Jane Flat also comes with a removable insole. This way, you can easily remove the current sole and slide in a custom orthotics. These nursing clogs use moisture wicking leather lining, to keep your feet breathing and avoid sweaty feet and unpleasant smells. Plus, the slip-resistant mini rocker bottom on the outsole boosts traction and allows your foot to flex, which in turn cuts down on foot fatigue. Whether you’re looking for black or Alegria white nursing shoes, these are the Alegria clogs to check out. Tired of all those poorly produced rubber clogs that just look cheap and don’t help at all with your aching feet? 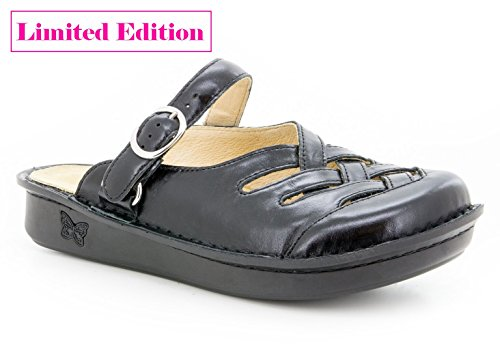 Well say goodbye to foot and lower back discomfort with the Alegria Women’s Fressia Leather Clog Limited Edition Leather Clog With Backstrap. This leather, limited exclusive edition clog is designed specifically for you. The buckle strap closure makes it easy to either have it slip above your foot or behind your ankle, depending on the support you need. Plus, the removable footbed (which is made from cork, memory foam and latex) can be removed in exchange for a custom insole. The overall construction of the nursing clog is designed to improve your natural movement, which cuts down on soreness in your lower back and spine after long workdays. If it sounds too good to be true, check out the excellent Alegria nursing shoes reviews on Amazon. This is a limited exclusive edition of the Freesia Leather Clog only available from Walking Comfort. Once this model is sold out, it is gone for good. Buckle strap closure can be worn in front or back. Hand sewn, leather lining, superior arch support, and plenty of room in the toe box. Rocker sole engineered to induce natural motion and encourage proper posture. Patented interlocking cork and man-made midsole. For the best deal on replacement footbeds search “alegria footbed 2 pack” here on Amazon. 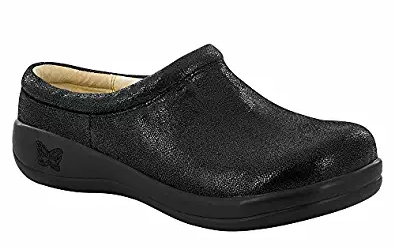 Interested in a pair of Alegria nursing shoes on Amazon that are comfortable and super easy to slip on and off? The Alegria Women’s Debra Slip-On is perfect for you. 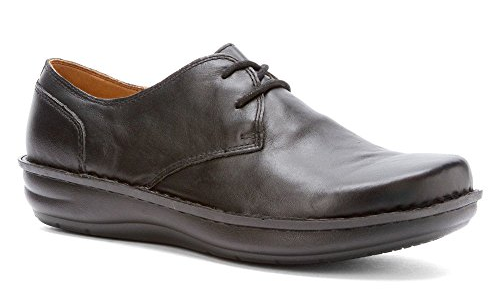 These imported leather shoes are comfortable and yet super easy to put on and off. Whether you work in a job where you constantly need to take your shoes on and off or you just like the ability to flip shoes off your feet for easy comfort, this pair is perfect. The synthetic sole gives you a one-inch platform with the heel pushing up slightly to 1.5 inches. The design itself is fun and the contrast-stitching end provides a comfortable foam foot bed with elastic goring. This way, it fits on your feet yet remains comfortable throughout the day. 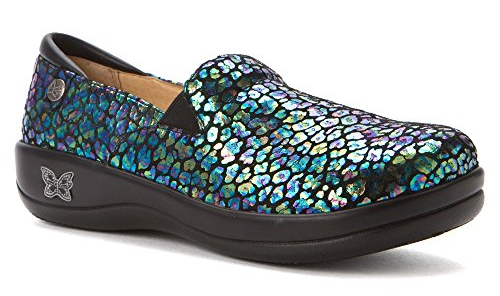 There’s a reason why these are some of the top Alegria nursing shoes Amazon has for sale. 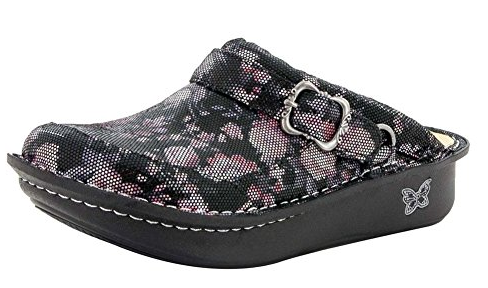 For those jobs where you need to wear black shoes but want something both fun and comfortable, the Alegria Women’s Kayla Clog is perfect. This pair of leather Alegria clogs comes with a rubber, no slip sole, so you can work in nearly any indoor environment. Known as one of the nursing shoes most comfortable designs, it’s also great for when you don’t need a high platform. At just half an inch, it is one of the thinner soles out there. It does accentuate up to 1.5 inches in the heel. The patented removable foot bed allows you to easily slip out the current memory foam and cork foot bed in favor of your own insert. This way, you can take complete and total control of how comfortable your feet are with these nursing clogs. Interested in a no slip pair of Alegria clogs that helps you get through a day on your feet in both comfort and style? 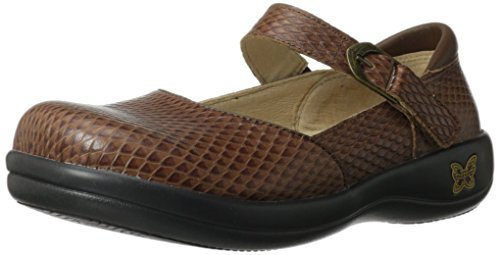 If so, check out the Alegria Women’s Keli Professional Shoe. This pair of leather Alegria nursing shoes is made with a low-top arch to keep help prevent pain in your back and feet. Plus, the Nappa leather and printed leather upper adds just enough flash to accentuate your outfit, regardless of if you’re wearing nursing scrubs or work in a kitchen. The latex memory foam-cushioned insole keeps your feet comfortable all day, so at the end of your shift your feet are still comfy and ready to go. With the Alegria Women’s Alli Flat comes style and sophistication. The beautifully designed leather Alegria nursing shoes feature a seamless leather construction with a non-slip rubber sole. Perfect for those long work days where you need a pair of shoes that not only are comfortable, but can support your busy lifestyle. These Alegria nursing clogs come with a removable cork and memory foam foot bed, allowing you to add your own custom foot bed based on your own arch and foot support needs. With a one-inch platform and a two-inch heel, the discount Alegria clogs gives you both height and plenty of necessary arch support. Slip into the comfortable Alegria Women’s Debra Professional Shoe and you’ll quickly discover your foot pains float away. Gone are the days of sore feet after long days of work. The leather construction and synthetic sole is perfect for nearly any long-work day. With ample cushioning and a solid, closed-toe design, you’ll quickly wonder why you didn’t invest in these shoes earlier. You’re going to be on your feet all day, so you might as well opt in for the nursing shoes most comfortable fit. When it comes to a low-profile pair of Alegria clogs, few can compare with a Alegria Women’s Dayna Professional Shoe. These professional shoes have a leather construction with cork sole. With a slender .75-inch platform, it is perfect for anyone looking for a comfortable shoe without a ton of added height. Plus, the slender strap over top can be adjusted, ensuring the perfect fit every time. 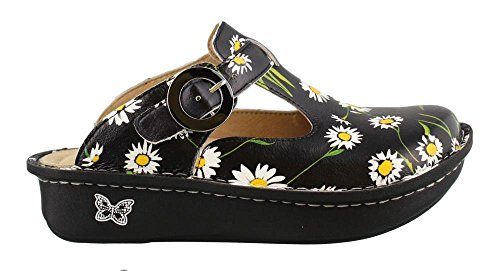 When going through different Alegria clogs on sale, put these at the top of your list. When searching for part dress shoe, part comfort, there’s nothing like the pair of Alegria by PG Lite Men’s Liam Oxford shoes. These Alegria shoes are perfect for the man who’s always on his feet yet needs to look his best. The leather upper construction of the shoe presents a classic Oxford design, while the slip resistant polyurethane outsole provides the necessary arch support for all day work. Plus, the removable insole is great for anyone with his own custom inserts. The laces on the Oxford style of shoe are simple yet elegant, going with the minimalist overall appearance of the shoes. Nobody else will know these shoes are designed as protective, slip-free options and will simply assume these are just beautiful work shoes. You’ll be hard pressed to find a better pair of Alegria clogs on sale. 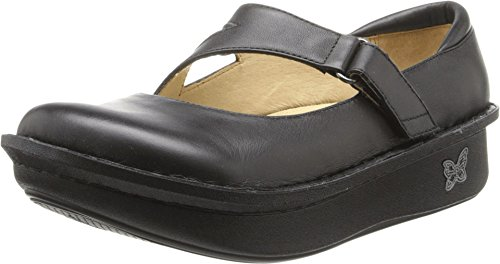 A pair of Alegria Women’s Debra Professional Slip Resistant Work Shoes is great for anyone looking for a bit of fun with their footwear yet still in need of a comfortable, non-slip clog. 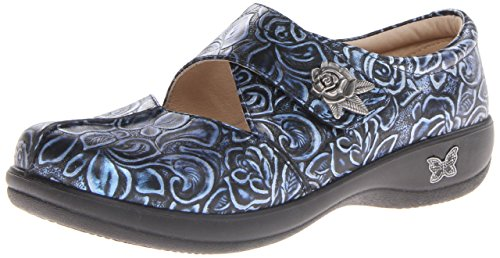 These Alegria white nursing shoes come with a fun design on the leather while the rubber sole is designed to remain stationary and avoid the common slippage that may occur throughout the day. This pair of Alegria nursing clogs features a slip-on design, so it’s easy to take the shoes on and off, yet it remains secure to feet throughout the day. This is perfect for anyone entering and exciting a location where shoes are not permitted. In need of a work shoe that has more of a professional, classic feel to it? 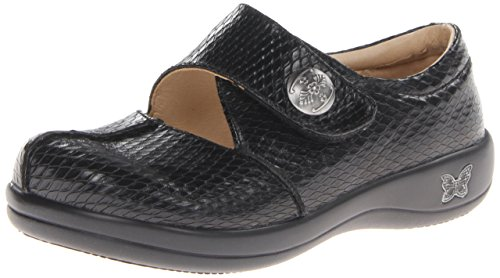 If so, the Alegria Women’s Kyra Professional Slip Resistant Work Shoe might be the perfect option for you. The leather top half is designed to replicate that of high-end snake leather, while the rubber sole provides you with the non-slip footing needed. 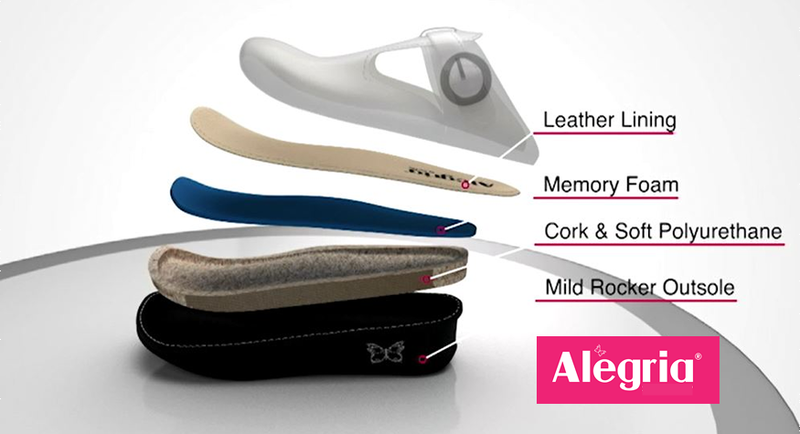 All of this comes with a patented removal comfort insole with a memory foam, cork and suede top. This way, feet are comfortable and secure, no matter what with the discount Alegria clogs. The professional appearance of the Alegria Women’s Taylor Slip-On gives off the look of an everyday dress shoe. However, this Alegria shoe is anything but. With the leather top, it comes across as professional and perfect for everyday work and meeting with clients. 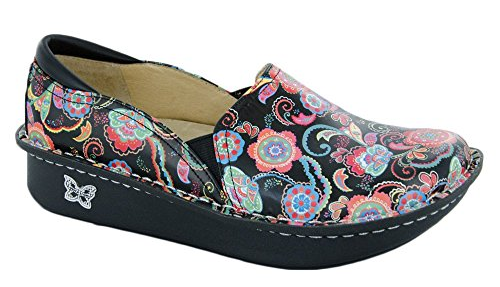 The bottom rubber sole Alegria Debra clogs come with tremendous arch support and does not leave marks thanks to the synthetic and black rubber design. Plus, the removable memory foam, latex and cork foot bed with suede top comforts feet for as long as the Alegria clogs are worn. Fashion meets comfort with the Alegria Women’s Kaitly Professional Slip Resistant Work Shoe. This pair of Alegria clogs features a leather top and adjustable strap, ensuring it is possible to always remain comfortable, no matter how long you remain standing. The platform itself is slimmer than most Alegria shoes at .75 of an inch, with the heel pushing up to 1.5 inches in height. The synthetic sole on the bottom of these Alegria white or black nursing shoes helps prevent slipping, making it the perfect footwear for when you need to look professional, yet need a slip-free shoe. 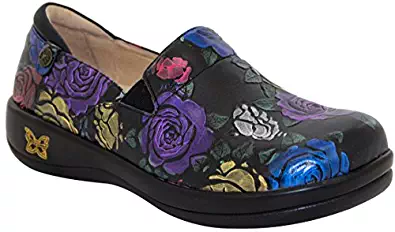 The colorful and fun design of the Alegria Women’s Kaitlyn Professional Slip Resistant Work Shoe is a fantastic addition to anyone in need of a classic looking, professional shoe, yet offers function as well. 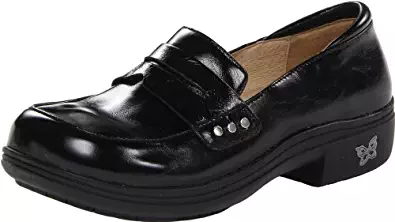 The rubber sole on the bottom of these leather Alegria nursing shoes is slip resistant, so no matter the work environment, slipping will not be an issue. 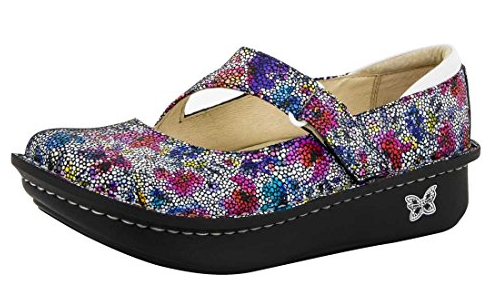 The platform measures just .75 inches, so for anyone looking for Alegria clogs that are not necessarily tall, this is a great pair. The heel measures up to around 1.5 inches. With a patented removable comfort insole featuring memory foam, cork and a suede top, the foot will always remain comfortable, yet anyone with a custom insert has the room to slip it in to keep their foot feeling great. 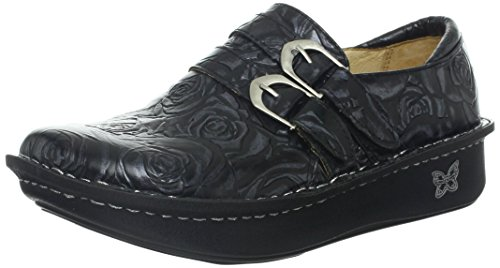 So read up on the Alegria nursing shoe’s reviews and you’ll find it is one of the best discount Alegria clogs available. When it comes to footwear with solid Alegria nursing shoe reviews, the Alegria Women’s Keli Exclusive Professional Shoe stands out as one of the best. The fun pattern is perfect for those searching for a bit of fun in their Alegria clogs, yet still need function. With this pair of comfortable nursing clogs, the leather top offers a solid construction, while the elastic instep provides a secure fit. Additionally, the cork, memory foam and polyurethane loaded foot bed offers a perfect fit. Plus, it is possible to remove the foot bed, making it possible to slip in a custom insert. The hand sewn leather lining helps avoid snags and other stitch problems common with quickly produced Alegria shoes, which improves the durability of the nursing Alegria shoe clogs. Cork, memory foam and polyurethane loaded footbed creating a ‘perfect fit’ by forming to the natural contours of your foot. 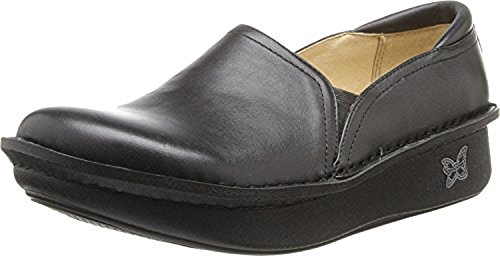 For the woman who wants a functional nursing shoe yet could go for a splash of American Southwest, the Alegria Women’s Joleen Loafer is the ideal construction and design. Made from tanned leather and featuring a large gold colored snap with turquoise center, the nursing shoe looks straight out New Mexico. The combination of leather on the top and the rubber sole ensure the Alegria clogs are not only great to look at, but slip preventing as well. These comfortable Alegria nursing shoes offer a padded collar to secure the foot once in, and yet it’s easy to kick the shoes off thanks to the slip-in feature. The adjustable instep strap with hook and loop closure allows for additional adjustments.